Today’s Opinion page had a column by Sallie Maron of Sound Food, a new organzation promoting local food on the island. Sallie’s piece was the first of five on the topic of local food production, farming and sustainability we’re planning to run over the next three days as a prolouge to a project that is something new for us to be involved in. 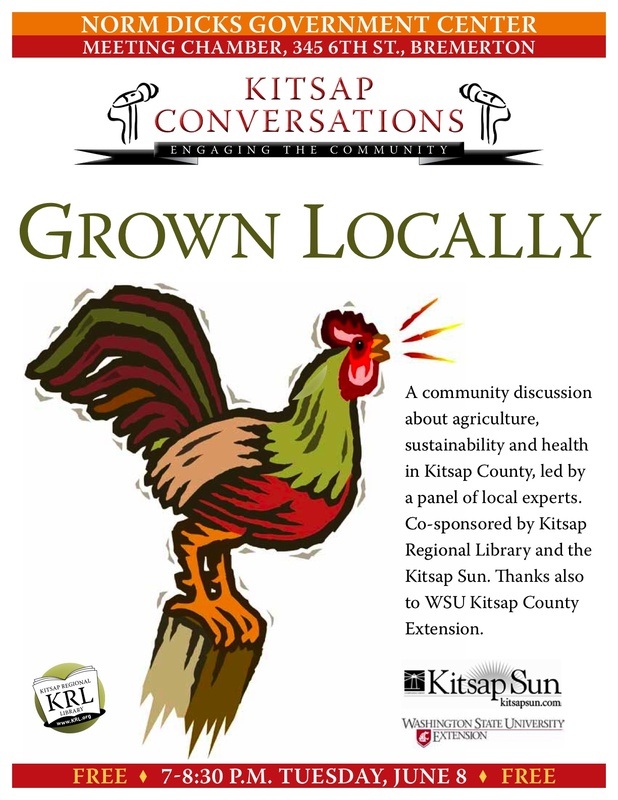 The reason for her column, as we explained in a note in today’s paper, is to set the table for an event we’re hosting in conjunction with the Kitsap Regional Library and WSU Extension. Next Tuesday, June 8, at 7 p.m. in the Norm Dicks Government Center we’ll hold the first “Kitsap Conversation” forum. We’re calling this one “Grown Locally,” to address the topic of local food and farming in our county, and what that trend will mean in the future. It’s a topic that is covered periodically in our pages as farmers come up with new ideas or restaurants open to serve food grown in our area, but rarely does a story address the broader context, or do so in a way that can accommodate questions from different angles. That’s what we hope to do in the forum. The idea is to host another one or two similar events through 2010, with different topics. KRL is planning to survey it’s patrons on what they’d be interested in discussing, and we’ll post a poll on our site as well. We’re thinking about broad topics that don’t settle on a specific debate. For instance, how to be an involved parent in educational issues, or ways to sustain Kitsap’s economy into the future. If you have ideas for a conversation topic, leave a comment below. Look for the next “Grown Locally” column in Friday’s edition, and hopefully we see a few of you Tuesday.